Lucy Grymes was born in 1734. She married Maj. Gen Henry Lee II, son of Henry Lee and Mary Bland. Lucy Grymes died in 1792. [S676] Gary Boyd Roberts, Presidents 2009 Edition, page 207. Mary Bland was born in 1704. She married Henry Lee, son of Richard Henry Lee Jr. and Laetita Corbin. Mary Bland died in 1764. [S677] Gary Boyd Roberts, "New England Ancestors: Barack Obama." Rolla and Leona were enumerated in the 1930 Augusta, Butler Co., KS, federal census. He was a bookkeeper at an oil company, age 37, she was 32. Children in the household were Madelyn 7, Charles 5, and Arlene 3. [S676] Gary Boyd Roberts, Presidents 2009 Edition, page 206. [S182] Social Security Death Index (on-line), Ancestry.com, SSDI, Ancestry.com, SSAN 443-01-1898. Alfred Allen Goddard was born on 19 October 1891 at NM. He was the son of William Pace Goddard and Ann Kirrilla Taylor. Alfred Allen Goddard married Ethel Maude Scott. Alfred Allen Goddard died on 30 November 1975 at age 84. Alfred and Ethel were enumerated in the 1930 Westminster, Adams Co., CO, federal census. He was a machinist in a railroad shop, age 38, she ws 36. Children in the household were Margaret 11, Alfred 9, and Robert 3 years 3 months. Charles and Della were enumerated in the 1900 Shawnee, Johnson Co., KS, federal census. He was an auctioneer, age 38, she was 37. Children in the household were Lillie 10, Rolla 7, Estella M. 6 Frank B. 4, Elva V. 2, and an unnamed baby 1 month. Charles T. was enumerated in the 1910 Aubry, Johnson Co., KS, federal census. He was a farmer, age 48. Also in the household was Lillian B. 20, Stella M. 15, Rolla 17, Burke F, 14, Elva R 12, and Ora B. 10. Charles T. was enumerated in the 1920 Rosedale, Wyandotte Co., KS, federal census. He was a tire repairer in a tire shop, age 58, widowed. Also in the household were Lillian D. 30, Frank B. 24, and Ora B. 19. Charles T. was enumerated in the 1930 Kansas City, Wyandotte Co., KS, federal census. He was a livestock dealer, age 68. Also in the household was Lillian 39. Jane Pyle was born circa 1561 at Babton, Wiltshire, England. She was the daughter of Thomas Pyle and Elizabeth Langrish. Jane Pyle married Thomas Ludlow in 1581 at Wiltshire, England.1 Jane Pyle died after 1607. [S676] Gary Boyd Roberts, Presidents 2009 Edition. [S676] Gary Boyd Roberts, Presidents 2009 Edition, page 26. [S676] Gary Boyd Roberts, Presidents 2009 Edition, page 23. Edwin Hickman was the son of Edwin Hickman and Phebe Eastman. Edwin Hickman married Patsy Ann Isbell. Elliott Hickman was the son of Edwin Hickman and Patsy Ann Isbell. Elliott Hickman married Nancy Isbell. [S676] Gary Boyd Roberts, Presidents 2009 Edition, page 22. William Riley Davis married Christine Adeline Hickman, daughter of Elliott Hickman and Nancy Isbell. [S686] Rev. Frederick Wallace Pyne, Pyne's Register, page 381. [S686] Rev. Frederick Wallace Pyne, Pyne's Register, page 382. Elizabeth Churchill was born in 1710 at New Kent Co., VA. She married William Bassett on 29 January 1729 at VA. Elizabeth Churchill died on 16 April 1779 at Eltham, New Kent Co., VA.
Burwell Bassett was born on 3 March 1734 at Eltham, New Kent Co., VA. He was the son of William Bassett and Elizabeth Churchill. Burwell Bassett married Anna Maria Dandridge, daughter of John Dandridge and Frances Jones, on 7 May 1757 at Chestnut Grove, VA.
Harbin and Elizabeth were enumerated in the 1850 Ozark Co., MO, federal census. He was a farmer, age 24, she was 21. Children in the household were William Wirt 1 and Thomas 5 months. Also enumerated was Samuel McCurry 17, a laborer. Harbin and Elizabeth were enumerated in the 1860 Granby, Newton Co., MO, federal census. He was a blacksmith, age 37, she was 31. Children in the household were William 11, Thomas 9, Edward 7, Mary 5, Samuel 4, and John 1. "Harvey" and Elizabeth were enumerated in the 1870 Lincoln, Andrew Co., MO, federal census. He was a blacksmith, age 46, she was 41. Children in the household were Thomas 20, Edward 18, Mary 12, Samuel 11, John 10, Jacob 9, Sophronia 7, Arthur 5, and Daniel 2. [S676] Gary Boyd Roberts, Presidents 2009 Edition, page 208. Martha was born in New Kent County, Virginia, the daughter of John Dandridge and Frances Jones, farmers. She grew up in what has been described as the "second tier" of planters in colonial Virginia, farm owners with respectable holdings but not wealth. Little is known of her childhood and early years. When she married Daniel Parke Custis in 1749, she moved into a much more elevated position in society. Twenty years older than his bride, Custis was one of the wealthiest men in the colony. Martha Dandridge Custis moved to her husband's estate, called "White House," on the Pamunkey River. The couple eventually had four children, two of whom died in early childhood. The family enjoyed a normal life until Daniel Parke Custis died, probably of a heart attack, in 1757. At the age of twenty-six, Martha Dandridge Custis became probably the wealthiest widow in all of Virginia. The Custis estate, which included nearly 17,500 acres of land, was divided between Martha and her two young children. By her mid-twenties, Martha Custis had attained the physical state that she would long be remembered for. Only five feet tall, she had large eyes, an acquiline nose, and plump face. Physically, she was quite unremarkable, but people continually commented on her easy, yet dignified, manner. It was probably these qualities, in addition to her great wealth, that attracted the attention of the young George Washington. He courted her during the spring of 1758, and, following the successful Anglo-American campaign against French Fort Duquesne in the autumn of 1758, the couple was married at White House on 6 January 1759. Washington warmly accepted her two children, and the new family arrived at his Mount Vernon plantation in April 1759, starting what would be a thirty-year marriage and partnership. Fifteen prosperous and peaceful years followed. Martha Washington relished her role as the mistress of the household and was always known as a cheerful and gracious hostess. She and George Washington did not have any children of their own. Martha Washington worried greatly over the health and well-being of her two children from her first marriage, with some reason. Her daughter Patsy suffered from epilepsy and was treated by many doctors to no avail. In 1773 Patsy died following an epilectic seizure, and Martha Washington was inconsolable. Her son Jacky was at that time studying at King's College in New York, but he soon returned to Mount Vernon as a comfort to his mother. Jacky married in 1774 and moved to "Abingdon," his estate, upriver from Mount Vernon. George Washington thought his stepson's marriage was hasty, but he was soon taken up by intercolonial, imperial, and eventually national matters. He served in the second Continental Congress in Philadelphia and on 18 June 1775 was named as commander in chief of the new Continental army. All but three of George Washington's letters to his wife were destroyed by Martha Washington in 1802. One of them was written just after the appointment: "You may believe me my dear Patcy [sic], when I assure you, in the most solemn manner, that, so far from seeking this appointment I have used every endeavour in my power to avoid it, not only from my unwillingness to part from you and the Family, but from a consciousness of it being a trust too great for my Capacity" (Fields, p. 159). Despite this sentiment, Washington would be away from Mount Vernon for all but four days from that point until Christmas Eve 1783. In November 1775 Martha Washington left Mount Vernon and traveled to Cambridge, Massachusetts, to join her husband in winter camp. There she became friendly with the wives of other leaders of the Continental forces, among them Kitty Greene, Lucy Knox, Elizabeth Gates, and Abigail Adams. This winter of 1775-1776 set a precedent; each winter that came while the Revolution was being fought, Martha Washington joined her husband in camp. The most notable time was probably during the Valley Forge winter of 1777-1778, when many observers noticed what a difference her presence made to her husband's spirits and overall health. Throughout trials such as the Valley Forge winter and the military setbacks that ensued for the Americans, Martha Washington continued to make a favorable impression on nearly all those who met her. The American victory at Yorktown in 1781 was not quite the end of the Revolution for the Washingtons. It was in fact a year of tragedy for the family. Jacky Custis had gone with George Washington to Yorktown and died of camp fever. The loss of her son left Martha Washington with no children of her own still living. She and George Washington took the two youngest of Jacky's children (George Washington Parke Custis and Eleanor Parke Custis) into their home and raised them. It was not until Christmas Eve 1783 that George Washington returned to Mount Vernon and that Martha Washington was able to resume what she always maintained was her true delight: comfortable domestic life. The mid-1780s provided a delicious respite for the Washingtons, one that was, however, ended by the call to George Washington to become the first president of the United States in 1789. Martha Washington did not attend the inaugural in New York. She arrived a few weeks later, and the couple lived first in New York and then from 1790 to 1797 in Philadelphia. Just as George Washington set numerous precedents as the first president, so did Martha Washington establish customs as the first wife of a president (the term "first lady" had not yet emerged). She hosted Friday night receptions and generally presented a courteous and dignified demeanor in her role. In private letters to her family, she revealed that she felt more like a prisoner than anything else, but her public behavior was always in good taste. Martha Washington was delighted when her husband's second term ended in 1797. The couple returned to Mount Vernon and for two and a half years were able to resume the peaceful domesticity that they had enjoyed between 1760 and 1775 and then from 1783 to 1788. Following the death of George Washington in December 1799, Martha Washington closed off the bedroom they had shared and moved to a small chamber. She continued to receive many visitors during the last period of her life. Following the dictates of her husband's will, she freed his slaves one year after his death. She kept her own slaves and bequeathed them to relatives. She died at Mount Vernon. Martha Dandridge Custis Washington led a remarkable life. A number of circumstances propelled her far above the station that she might have envisaged for herself in her youth. From a middling station in Virginia society to the height of wealth and prominence in that colony, she rose with her husband to become one of the best-known American women of her time. Certainly not a forward or radical thinker like Abigail Adams or Mercy Otis Warren (both of whom she knew and liked), Martha Washington epitomized the careful cultivation of manners and domesticity that served her so well in her roles as wife of first the Continental commander in chief and then president. Because she burned the great majority of the correspondence between herself and her husband, it will never be known to what extent she may have influenced his decisions in those roles. Indeed, historians may never know whether the Washingtons enjoyed a life of great affection for each other or whether theirs was a careful and considered relationship. Frances Jones was born in 1710. She married John Dandridge. Frances Jones died in 1785. Edwin Hickman was the son of Edwin Hickman and Eleanor Elliott. Edwin Hickman married Phebe Eastman. 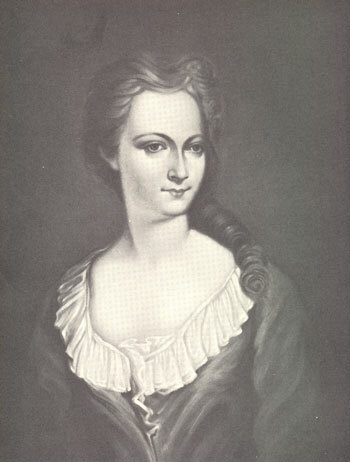 Anna Maria Dandridge was born on 30 March 1739 at Chestnut Grove, VA. She was the daughter of John Dandridge and Frances Jones. Anna Maria Dandridge married Burwell Bassett, son of William Bassett and Elizabeth Churchill, on 7 May 1757 at Chestnut Grove, VA. Anna Maria Dandridge died on 17 December 1777 at Eltham, New Kent Co., VA, at age 38. Lucy Harrison was born circa 1755 at Berkeley Plantation, Charles City Co., VA. She was the daughter of Benjamin Harrison V and Elizabeth Bassett.1 Lucy Harrison married Peyton Randolph, son of Sir John Randolph and Susannah Beverley, say 1775; no issue. Lucy Harrison died in 1809 at Staunton, Augusta Co., VA.
Susannah Beverley was born in 1690. She married Sir John Randolph, son of William Randolph and Mary Isham. Susannah Beverley died on 15 March 1737. Jane Bolling was born in 1698. She was the daughter of Major John Fairfax Bolling and Mary Kennon. Jane Bolling married Colonel Richard Randolph, son of William Randolph and Mary Isham, in 1720. Jane Bolling died on 4 March 1766. Jane Rolfe was born in 1650. She was the daughter of Thomas Rolfe. Jane Rolfe married Colonel Robert Bolling.